Thank you for keeping us updated on all your kitties. I can’t explain why, but it really helped me after the death of my Lilac point Max. We have new kittens now. 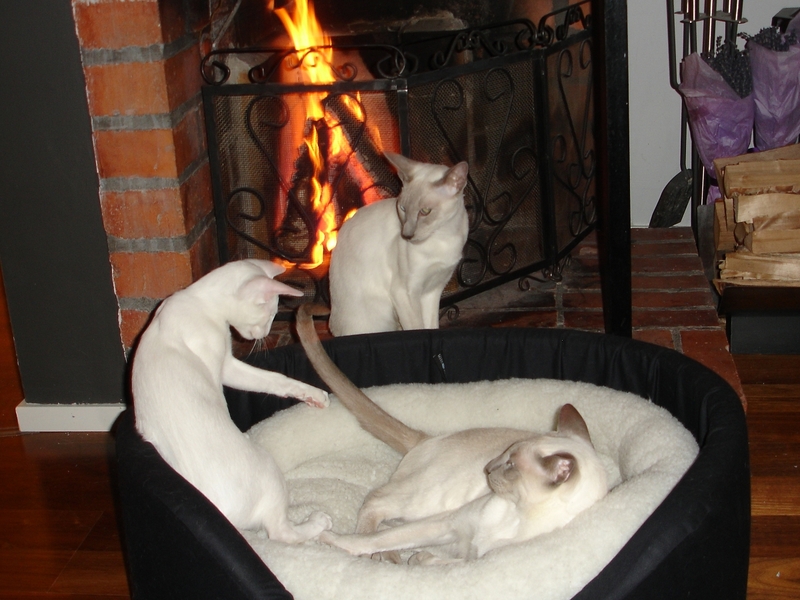 Both males, a lilac point siamese and a fawn point oriental. They also got to see fire for the first time last week. They loved sleeping by it. Dear Jodi, I am very sorry for your loss. It is terrible when a dear animal dies. We call them pets, but they are much more than that. The fireplace – in two weeks we will move to a house, and there are two fireplaces there! I hope that Albert will grow out of his “fireplace exploring” phase, otherwise we may need to buy glass doors or something for the fireplaces to prevent him from going there. Jossan had seven kittens, and the only one who was so extremely fascinated by the fireplace was (of course) the only one completely white; the one we decided to keep – a little panda called Albert.